London is facing a massive attack on our NHS through a toxic mix of cuts, closures and privatisation. Reports show the crisis of ambulance and A&E waiting times, cancelled operations and overstretched GPs. With yet more proof our NHS is at breaking point, Government reforms only threaten more privatisation. Londoners have had enough and are organising across the capital to defend their NHS. Tens of thousands of Londoners have protested, marched and signed petitions. 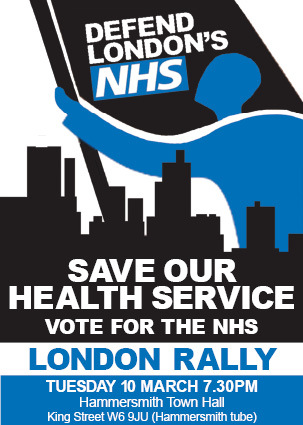 The Rally aims to make our demands to defend the NHS a key election issue. Bringing together people from across the capital including patients, health staff, campaigners and trade unionists can undermine divide and rule tactics of playing one hospital or service against another. Speakers include clinicians, campaigners and politicians serious about defending our NHS with more than warm words. Discussion will highlight campaigning action in the run up to the general election to win the fight to defend our health services.